No one is talking about this free traffic source. It’s the Warrior forum blog. If you’ve got a Warrior forum account, you’ve got a blog you can post articles to. Remember article ‘Bum’ marketing? Where you posted articles to Ezine articles and made Squidoo lenses and you got all that free Search traffic? Guess what, that kind of traffic is still out there! Warrior Forum is a PR4 site – so Google loves it. Google indexes Warrior Forum pages like there is no tomorrow. The numbers are a bit hard to see in this screen shot, but I’ve had 1493 views on one article. The other posts are around the same 1000 view mark! How does this equate to traffic? Just like the ‘Bum’ marketing method, you put your links back to your website inside the article. You can add hyperlinked images and of course text anywhere inside your article. There are no restrictions (that I’m aware of) about what you can post on your WF blog. You’ll get a percentage of readers clicking through to your website from these links. I’ve not tracked the number of clicks to my websites so I can’t tell you the exact numbers. The number of clicks you get to your website will depend on where your links are and what they look like. And of course, how relevant your website is to the content that you’re posting. 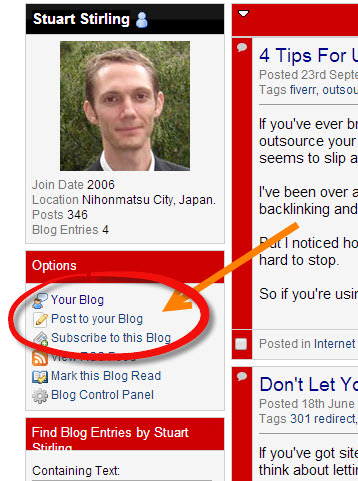 So to break it down into steps, here’s how to get traffic from your WF blog. 4. Post something awesome to your WF blog! Keyword research and all that is important. If you’re relying on Google to send you the traffic, then yes, do your Keyword research! Don’t dismiss the traffic flowing through from Warrior Forum itself though. The WF is a traffic powerhouse. If you’re active in the Forum discussions, a percentage of the traffic will click through to your profile and check out your posts and blog entries. What I love about this traffic is that it’s set and forget. It’s free targeted traffic that will trickle in for years like it has already been doing. It’s not going to get you an instant flood so if that’s what you’re looking for, you’d better try buying some PPC or email traffic. It’s a long-term method, but as you can see, it works. Try it out! p.s. This is not just limited to the Warrior Forum and the ‘internet marketing’ niche. I’m positive that you can use this free traffic method in ANY niche where there is an authoritative forum. That’s a great idea, Stuart, thanks for sharing it. 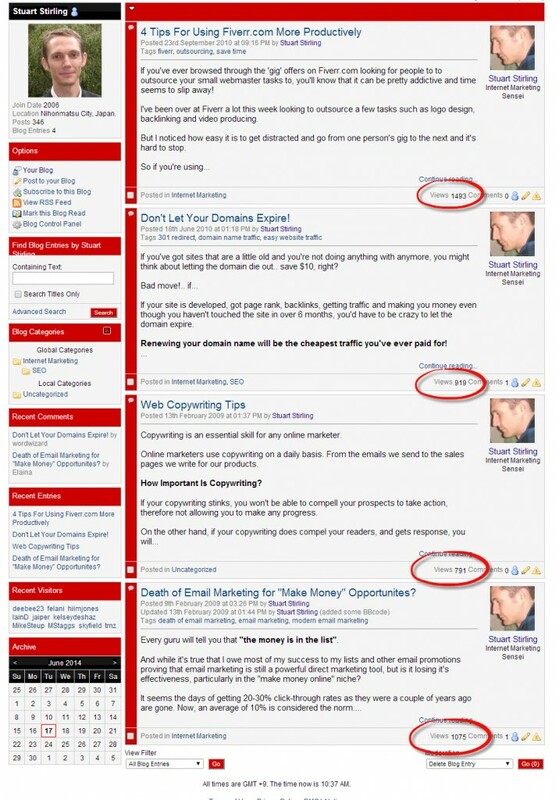 Although I knew that forums can be a great source for free traffic, I didn’t think about making use of the blogging feature at Warrior Forum. I will definitely check it out soon.